“The 9 Muses” name comes from Greek Mythology which is rich with gods and goddesses but none were as influential as the Nine Muses who were created to give inspiration, knowledge, artistry and music to the ancient world. Hence it fitting that the 9 Muses choose this name as included in projects The 9 Muses have been responsible for and are proud to have in their portfolio are not only Art but also Music, Education and Film & Documentary. One of these Documentaries is the The Founder. This covers the full life and legacy of Brother Walfrid as we know it so far but the dvd documentary, which comes with the limited edition boxed set of Brother Walfrid, wasn’t always intended to be that. When we were designing and developing ideas for the project and the stunning packaging for the Limited edition Prints of Peter Howson’s Brother Walfrid and we knew we wanted to do it do the highest possible degree of quality and not cut a single corner, after all we had to do the name of Brother Walfrid proud with this project. Therefor we would use the best inks, the most beautiful fine art paper, it would be colour matched and picked by the artist, Peter Howson and it would be packaged and authenticated in the most sophisticated way possible. We had intended to ‘document’ these wonderful processes, techniques and hopfully discover more about Peter’s (Howson) inspiration behind his depiction of Walfrid along the way. But, like anything we do here at The 9 Muses the process of documenting our efforts and expertise we had involved in Peter Howson project had incubated immense passion by this time – we had researched Brother Walfrid’s full life, i’d dedicated most of my free time to researching Walfrid with enlisted help from Professor Joe Bradley, Sir Tom Devine, had read countless articles, visited Archives in Glasgow and researched archives in Rome, the list was endless. Our passion for Brother Walfrid, what he stood for and the social and biological factors that may have caused him to have become the man he became, they had not only truly inspired us to continue to make a difference in the name of Walfird, but it had captured out hearts enough to make it impossible not to make a short film about it. The Founder was Founded. Our next step was to secure interviews with these iconic experts- Bradley and Devine, Howson was already so willing to spread the work he was over the moon to give his interviews on such a passionate subject- an image that representated Faith and helping those who needed it . Done. We hired filmakers and heading their operations up was BAFTA award winner Paul Hineman, with him we toured Glasgow,Dumfries and Galloway, Sligo and Strokestown, Ireland filmaing all things Walfrid, Celtic and exploring The Great Hunger in even greater detail. Peter Mullan with Emma O’Neil-Recording voiceover . The greatest impact was still to be achieved by captivating peoples emotion through all of the senses, we wanted to explore Original score music for this documentary, it had to be original like every other thing involved in this project- it had to belong to Walfrid. This lead us to work on composing and engineering tracks with GRAMMY Award winner, David Donaldson . David is awarded for this work on Academy Award winning movies like “Ray” with Jamie Foxx, The Great Gatsby and Moulin Rouge. What a captivating watch we had. I remember going to view for the first ever time in Paul Hineman’s office at 8pm in Glasgow city centre and i was just overwhelmed by how well it represented our efforts for Walfrid. i have worked with Peter Howson fopr many years but watching his exclusive interviews on his inspiration for how he painted Walfrid and the starving imigrants of the Irish Famine …..Epic! The Documentary was screened in 3 private viewings to Bloggers, Journalists, investors and Massive celtic officials and executive directors. We continue to research Brother Walfrid’s Life throught the PhD but also we have made major inward roads to do a seconf film on Walfrid’s Life. We would love to hear from campaigners about their thoughts on the documentary and any future works. CELTIC FC and Celtic FC Foundation are delighted to announce a partnership with The 9 Muses. It certainly is fitting that we can announce this at Christmas time, with it being such an important time for giving during the festive season. This announcement also sees us giving a FURTHER 10% proceeds to Celtic FC Foundation and in time to maximise for their Christmas Appeal. That is a whopping 40% The 9 Muses are giving to Charity from the sale of The Peter Howson, Brother Walfrid Limited Edition Boxed Set. This elevates our passion and pride for this project and campaign even more. Here is the official announcement from Celticfc.net Celtic’s official website. “CELTIC FC and Celtic FC Foundation are delighted to announce a partnership with The 9 Muses, the arts group behind internationally-acclaimed Scottish artist Peter Howson’s famous painting ‘Brother Walfrid’. In 2014, Peter Howson’s painting of Walfrid was unveiled, and is displayed in St Mary’s in the Calton, where Brother Walfrid founded Celtic, on November 6, 1887. To raise further awareness of the life of the club’s founding father, The 9 Muses have produced 1,888 premium boxed sets, which include an A3 museum-quality Peter-Howson-signed print of his painting, and a one-hour documentary on the life of Walfrid, entitled ‘The Founder’. A total of 30 per cent of the proceeds of each boxed set currently go towards the Renovation Fund of St Mary’s. And, to make an even more impactful contribution to charity this Christmas, The 9 Muses have very generously opted to distribute an additional 10% of all proceeds to the club’s charitable arm, Celtic FC Foundation. Emma O’Neil, who owns and manages The 9 Muses, said: “The Peter Howson Brother Walfrid project has been one of the most important things I’ve done in my lifetime and The 9 Muses have immense passion for Brother Walfrid and everything he achieved personally. He is my biggest inspiration. “We have designed this product always with Walfrid’s ethos in mind which is why partnering with Celtic FC and Celtic FC Foundation plus having them endorse and now sell the boxed set brings a whole new level of pride to the project. Tony Hamilton, Chief Executive of Celtic FC Foundation, said: “Sincere thanks to The 9 Muses for making a contribution to the work of Celtic FC Foundation. We are truly overjoyed with this news and we hope the fans will be too. 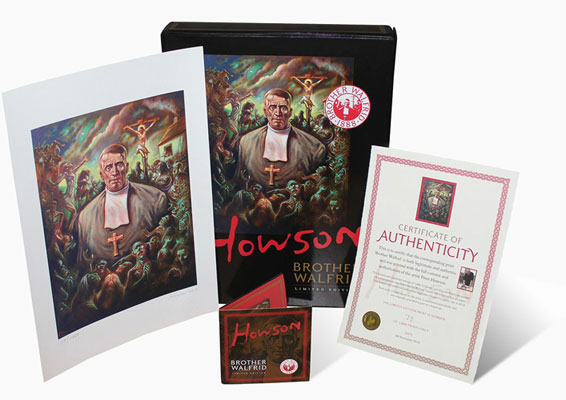 See The Peter Howson, Brother Walfrid Limited Edition Boxed Set in all of its glory in the video below……. In true Chrismas Spirit, The 9 Muses, along with Michael Connolly is doing ’12 Days of Walfrid’, each day starting today we will be giving away exclusive interviews, facts, behind the scenes looks at the Brother Walfrid Campaign and how we have developed it. We will also be giving away some amazing Brother Walfrid Merchandise and have a major announcement. Day One is us celebrating Walfrid’s Life and Timeline with these 12 Facts. Brother Walfrid was born on 18th May 1840 in Carton Phibbs near Ballymote, County Sligo. He was Christened Andrew Kerins. Andrew Kerins left Ireland following An Gorta Mor – an event described the historian Christine Kinealy as ‘a truly terrible tragedy’ in which over 1.5 million people fled their homeland. It is understood that Walfrid left traveled across the Irish Sea with his friend Bart McGettrick on a coal boat at the age of 15 (in 1855 – soon after the Great Hunger). Michael Davitt – a leading figure in the formation of Celtic Football Club along with Brother Walfrid – referred to the Great Hunger as a ‘holocaust of humanity’ such was the scale of suffering. Brother Walfrid joined the Marist Brotherhood in 1864 at the age of 24 and traveled to Beauchamp in the south of France to take his oath and be educated in the Marist tradition. Walfrid was appointed the headmaster of St Mary’s school in the Calton area of Glasgow aged 34 in 1874. In Scotland, there were only 39 Catholics recorded in the city of Glasgow but there was 60 anti-Catholic societies – this hints at the anti-Catholic prejudice encountered by Walfrid and the thousands of other Irish Catholics who had immigrated during the nineteenth century. Celtic Football Club was founded in the parish hall of St Mary’s, Calton at a meeting chaired by John Glass with the stated aim of generating money for local charities. The Scottish Sport wrote in 1888 that Celtic FC was ‘the best combination of Irishmen that has ever been raised in Scotland, knitted together by an unquenchable desire to do honour to the Emerald Isle, from which they sprung’. Walfrid was transferred to London in 1892 by the Marist Brotherhood where he would work as headmaster of St Anne’s School in Whitechapel following his success in Glasgow. In 1911, Walfrid was quoted in the Scottish Observer at a celebration dinner hosted by Celtic as saying “Well, well, time has brought changes and outside ourselves, there are few left of the old brigade. I know none of these present players, but they are under the old colours and quartered in the dear old quarters and that suffices’. Brother Walfrid died on the 17th of April 1915 aged 74 – he lies in repose at Mount St Michael Cemetery in Dumfries where he spent his last years in retirement with the Marists. Remember The 9 Muses brings you all the latest from The World’s First PhD on Brother Walfrid, if you think your friends and family would love to join the Campaign then we would love to share our news and our passion. The Brother Walfrid statue outside Celtic Park. We’re here. It’s launch week. Getting to this point’s been a labour of love, but I do believe it’s one of the most important things I’ve done in my life. Namely, kicking off a campaign (and PhD) to raise awareness of a great man’s (Brother Walfrid’s) contribution to our nation, particularly the cultural identities of Catholics living in the west of Scotland. Andrew Kerins (or to give him his Marist Brothers title, Brother Walfrid) is best known as the founder of Celtic Football Club. And as such, has a special place in many people living in Scotland (and throughout the world’s) hearts. A panoramic view from the inside of Celtic Park. I grew up supporting the football team but while their on-field prowess has always interested me, it’s how the club came to be formed – to raise money for the Catholic immigrant population then living in atrocious conditions in Glasgow’s east end – that really drew my attention. And the more I read, the more I realised how this event and its aftermath shaped not just Glasgow’s development but Scotland’s too. It is estimated 200,000 emigrated to the UK from Ireland between 1845 and 1852, and a sizeable proportion of those to Glasgow. This new community had escaped starvation. But what met them in Glasgow was no bed of roses. Many struggled to feed themselves and relied on charity to get by. It was this displaced community that Marist Brother Walfrid spent 24 years of his life helping, first as a school teacher then as a headmaster of one of the Catholic schools in Glasgow that sprang up to educate people, many of whom could not read or write. He was a shining light, a beacon of hope for the poor and needy in Glasgow’s east end. An important figure for tens of thousands at the time, Walfrid is, of course, best known for his lasting legacy: Celtic. Walfrid had spotted the burgeoning sport of football’s potential as a force for good. He corralled community leaders and on November 6 1887, in St. Mary’s Church hall, founded Celtic F.C. Its aim? To raise money for the “penny dinner” scheme he had set up to feed the young children under his charge at St. Mary’s school. The rest, as they say, is history, as Celtic went on to become a unique club, coming to represent the worldwide Irish diaspora (there are in excess of 160 Celtic supporters’ clubs across 20 countries worldwide). But while in Celtic, Walfrid’s legacy is secure, details of his life are obscured. And here at Nine Muses we want to change all that. Already I’ve commissioned a life-size portrait of Brother Walfrid by Peter Howson (which hangs in St. Mary’s Church). I did this because I wanted to take Walfrid’s story to the public in a way that would grab attention, an iconic portrait by a famous Scottish contemporary artist. I also commissioned a one-hour documentary narrated by Scottish actor Peter Mullan so that when people wanted to find out more about Brother Walfrid, the documentary had some of the answers. And there’s a limited edition boxed set of the painting available to buy too. That’s a good start. But there’s more to do. That’s why, after nine month’s planning, we’re announcing today that we’re fully funding a PhD student to undertake a three-four year study into Brother Walfrid. I’d encourage you to sign up to our newsletter so you get all the latest information about what our PhD student, Michael Connolly, unearths. And that’s not all. The University of Stirling PhD forms part of a wider awareness-raising campaign – we’re also launching today – to get Brother Walfrid the recognition he deserves. So, that’s the potted history lesson and the information announcement, but what of my motivation? For such an important figure, little is known about his life and works. While there has been some renewed interest in recent years, Walfrid’s legacy has been dwarfed by the footballing superpower he created. I want to change that and shed more light on his contribution to the religious and cultural identities of Catholics in Scotland. It is the ethos he embedded in Celtic from day one that completely captivated me. Sport as charity. Sport as community. Sport as a cause. It’s a message ahead of its time. Brother Walfrid devised an innovative and ground-breaking way of raising not only funds but also the spirits and morale of a poor community; affecting tens of thousands in the process. And as Celtic grew, so did his legacy. Walfrid had grit and determination in a time of great adversity. Walfrid had his duties – for most of his time in Glasgow he was a headteacher – but his reach went far beyond the children he taught. He had a keenly felt duty to the large and in-need Catholic immigrant population of Glasgow and he discharged it with steely focus. Walfrid was a humble man. For me, his message is that quiet, charitable, and caring endeavour year after year after year is what matters. Walfrid looked after his community and I want to bring his work to a wider audience. Every month I’ll be writing a blog post about what’s going on in the campaign, and sharing my thoughts with our newsletter subscribers. And every two weeks we’ll send you a curated newsletter jam-packed full of interesting titbits for anyone who wants to find out more about Brother Walfrid, Celtic, and Catholic identity in modern-day Scotland. To get these updates sign up here now. Brother Walfrid is an important figure. Here at Nine Muses we want him to get the recognition he deserves. You can help by supporting the campaign (it’s free). Or, if you’ve got deeper pockets, you can show your support by buying one of our Limited Edition Brother Walfrid boxed sets. Thirty per cent goes to charity while the remainder is ploughed back into the Brother Walfrid awareness-raising campaign.